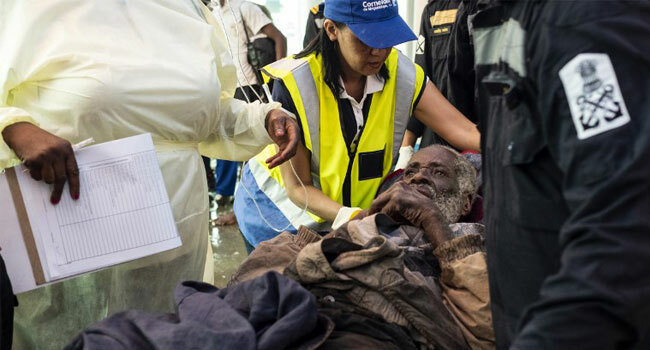 Aid workers faced disarray, a clamour for help and mounting anger as they headed out across central Mozambique, struggling to assist tens of thousands of people battered by one of southern Africa’s most powerful storms. A week after Tropical Cyclone Idai lashed Mozambique with winds of nearly 200 kilometres (120 miles) per hour, rescue efforts stepped up a gear on Friday but the situation was often chaotic. Humanitarian agencies are racing to rescue those still trapped, feed those who have been brought to safety and protect them from potential outbreaks of malaria and cholera. “Already, some cholera cases have been reported in (the port city of) Beira along with an increasing number of malaria infections among people trapped by the flooding,” said the International Federation of Red Cross in a statement. The mayor of Diaz Simango told AFP that cases of diarrhoeal infections had already been reported. “We are running out of time, it is at a critical point here,” UN children’s agency chief Henrietta Fore told AFP after she flew into the devastated port city of Beira from New York. Aid group, ‘Doctors Without Borders’ said people were also at risk of respiratory infections such as pneumonia. WFP declared the flood crisis a level three emergency, putting it on a par with Yemen, Syria and South Sudan. Relief agencies said the gravity of the cyclone and scale of the flooding it unleashed had been extremely shocking. The confirmed death toll in Mozambique and neighbouring Zimbabwe topped 550 on Friday, with 293 killed in Mozambique, and 259 in Zimbabwe, according to the UN Migration agency IOM, which said more than 120 of the dead in Zimbabwe had been washed into Mozambique. Districts west of Beira resemble an inland lake, and thousands of people are still trapped on roof tops and on tree branches. The town of Buzi situated across the estuary southwest of Beira “has reportedly disappeared, with the water as high as the palm trees” and 40 prisoners and staff still trapped on a roof, said the International Committee of the Red Cross (ICRC). “This disaster is a catastrophe,” Prime Minister Carlos Antonio do Rosario told reporters in Beira. The government says there are still around 15,000 people needing to be saved. More than 65,000 people are already in shelters in central Mozambique and other sites are being opened. In Dondo, near Beira, food distribution finally started on Thursday at one of 20 schools transformed into emergency shelters. “Today is the first day we receive help,” said survivor Marta Antonio. “But they don’t give it to everyone; they only give it to those who are in the rooms. But those outside receive nothing,” she said. Victims who were not housed in the centres were frustrated. They complained that they had been forgotten and for those lining up for something to eat, the food was insufficient. “I have four children, and they’re only going to eat bread? Give me a bag of aid,” demanded one man, who did not give his name. In Beira’s Samora Machel Secondary School, where President Filipe Nyusi was educated, more than 1,000 people found shelter, where many slept on the floor of an indoor basketball court. “Everything is difficult here. I’m fighting for my children to have something to eat,” said Celeste Dambo, who said that by lunchtime she had not yet eaten anything since the previous night. “People have suffered for weeks here, and they are understandably worried. This is a very difficult situation, on a massive scale, the response is building, you’re going to have hiccups, (but) a lot more people are weighing in,” said Bourke. The United Nations has launched an appeal for assistance. Meantime the main morgue in Beira is teeming with bodies and burials are impossible because the city cemeteries are flooded, said the ICRC. “The mortuary at the city’s main hospital is full and there are dozens of bodies that need to be removed and cared for in a dignified way,” said ICRC in a statement. “The humanitarian needs will tragically only deepen in the coming weeks,” it added. The mayor of Beira Daviz Simango has been helping clean up the city, driving excavator. “We are starting from zero, we have started the work,” he told AFP adding “our people have suffered a lot”. Meanwhile the ICRC has set up a dedicated website where missing people can be registered.